STM-R integrated steppers are drive+motor units, fusing step motor and drive components into a single device. This space-saving design eliminates wiring and saves on cost over conventional motor and drive solutions. All motor parameter settings are made via dip switches on the side of the unit, eliminating the need for setup software and reducing overall time to commission each unit. 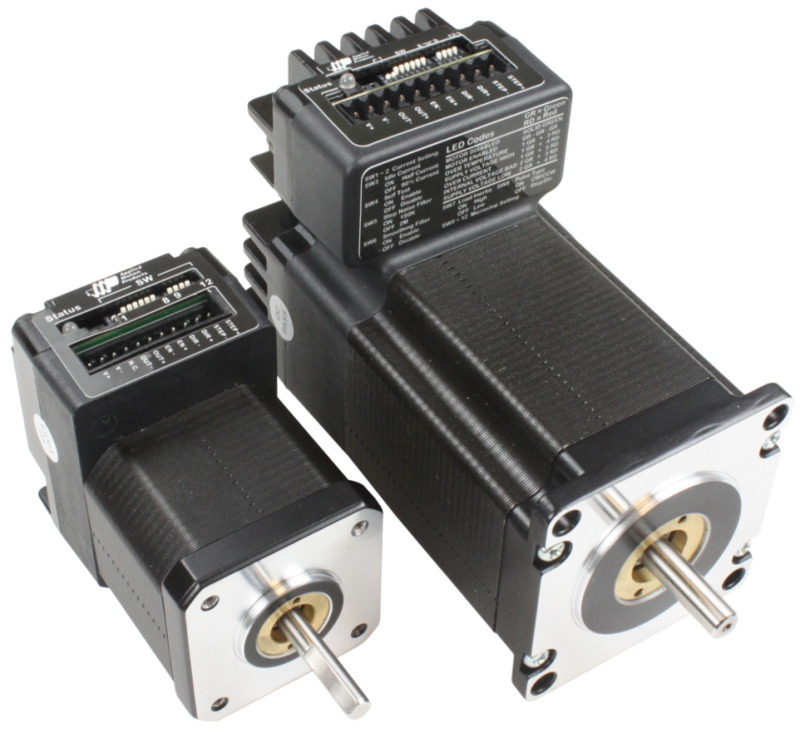 The STM17R integrated stepper combines a high torque NEMA 17 step motor with a sophisticated, 2.0 A/phase (peak-of-sine) step motor drive, while the STM23R combines a high torque NEMA 23 motor and sophisticated, 5.0 A/phase (peak-of-sine) step motor drive. Power to the unit, located at the rear of the motor, must be supplied by an external DC supply. Applied Motion offers compatible 24 and 48 volt DC power supplies for exactly this purpose. The STM-R integrated steppers are designed for step & direction (or pulse & direction) control. With the flick of a switch the STM-R motors can also be controlled by CW/CCW pulse (or pulse-pulse) signals. These units are designed for use with an external controller that provides one of these types of step pulse signals. Optional 1000-line (4000 count/rev) incremental encoders are available for the STM-R steppers. Each encoder is mounted externally to the drive enclosure, and the functionality available to the user is defined solely by the external controller used. All STM-R integrated steppers come with 3 digital inputs that accept signals of 5-24 VDC. The first two inputs are used for the step pulse signals and the third input is used to enable/disable motor power. Each unit also comes with 1 digital output for indicating drive and motor faults. Note that detecting stalls or missed steps requires both the encoder option on the STM-R and that the external controller has the functionality to monitor encoder position while commanding motor position. The available STM17R and STM23R part numbers are listed below, and are part of the larger offering of integrated steppers available from Applied Motion Products.